Top Notch Material: Belli Skincare- ALL of my Favorite Products! Belli Skincare- ALL of my Favorite Products! It's no big secret that I love Belli Skincare. I use AT LEAST two of their products every single day of my life, and use other multiple times a week. I used them when I was not pregnant, but am especially appreciative of the safe for pregnancy formulation they use now that I am pregnant. Beyond that, the products are just amazing and work really well while being gentle on my skin! I decided to make a list for you of Belli products I have received and tried over the years and what I think of each. As you know, during pregnancy, when your hormones are raging....you often have breakouts. Well, I have breakouts without pregnancy, because...well hormones rage with women all of the time! 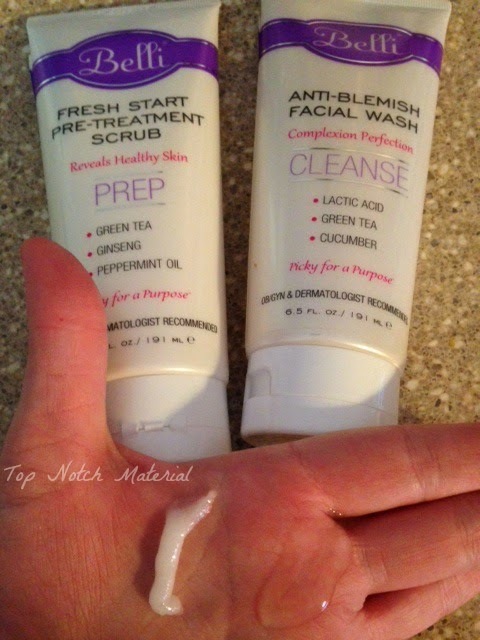 The Anti-Blemish Face Wash is just amazing. Not only does it smell nice...a nice soft scent, but it also cleanses my skin super well and does not leave it feeling dried out at all. I love that it takes care of blemishes, but does not over dry my skin like many common acne brands do and it also avoids the use of many common acne fighting ingredients that are not really safe for use during pregnancy. This is one product I swear by and use every single day of my life. Belli Eye Brightening Cream: It's no secret you are often tired while pregnant, but who wants to look that way? Belli Eye brightening cream can help with tired eyes. It is enriched with vitamin K and Vitamin C and both hydrate and reduce the appearance of dark circles. All ingredients are safe to use while pregnant and breastfeeding. This stuff really works! Not only does it make my eyes look less puffy and tired but it also leaves that sensitive skin feeling silky smooth and soft! I have been making a point to use this before bed every night and love the way my eyes look and feel now! Belli Pure and Pampered Body Wash: As you know many body washes can dry your skin out, and this is especially true when you are going through hormonal changes during pregnancy. Belli Body Wash cleans your skin without stripping it of your natural oils, and the soothing green tea and cucumber offer antioxidants. I absolutely love the scent of this wash. It has lavender and chamomile so this has become my bedtime wash since it soothes me and allows me to unwind after a long day of chasing a busy toddler! It lathers very well, and leaves me nicely scented when I step out of the shower! Belli All Day Moisture Lotion: I love a great lotion in the winter time when my skin can get dry and itchy. I also remember how important lotion was so me when I was pregnant and my belly grew bigger and bigger and got itchy! I was constantly applying lotion to try and soothe the itch. Belli's lotion is a rich and creamy lotion. It is a medium thickness lotion that absorbs pretty quickly into the skin and leaves me feeling hydrated and soft. I also love the very subtle chamomile scent. This tasteless lip balm thoroughly protects my lips and helps heal them too! It is a pretty thick lip balm which is great for the harsher winter months. I actually love the way it makes my lips feel and look because they ended up looking dewy and not dry at all! Belli Acne Control Spot Treatment- This very effective spot treatment works great for pregnancy acne and heals up my blemishes pretty quickly. It is not overly drying and contains only pregnancy safe chemicals. While I do not find it as powerful as some other acne spot treatments, it works great for the safe formulation and women that want to stay away from harsh chemicals during pregnancy. Be sure to check back here at the end of the month when we will be giving away a Belli Anti-Blemish Face Wash as part of our HUGE Baby Shower Event! Disclosure: I box of various Belli Products was received for review. I have not been compensated for this post. Top Notch Material blog will always provide honest opinions, beliefs or experiences on products reviewed. We will only recommend products or services that we feel are of benefit to our readers. If you have any questions, please contact me at nursemommypaige at yahoo dot com. The disclosure is done in accordance with the Federal Trade Commission 10 CFR, Part 255 Guides Concerning the use of Endorsements and Testimonials in Advertising. 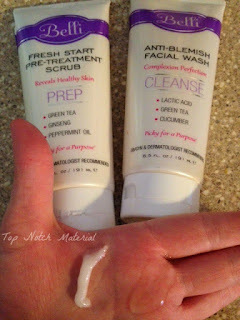 Would love to try the Belli Healthy Glow Facial Hydrator. I can't stand having dried skin either and everything I tr leave my face oily.